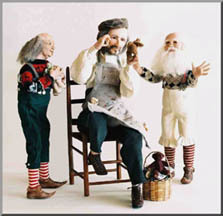 This 14 inch doll is sculpted of Creall Therm over a wire armature and has a hand-sewn soft-sculpted body. The boots are also Creall Therm. 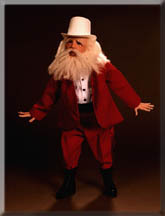 Broadway Santa was sculpted by Jack Johnston, who had seen a Santa tap dancing on Broadway for whatever the audience threw to him (so he had to go sculpt him). The photo on the left was done by Russ Robison. 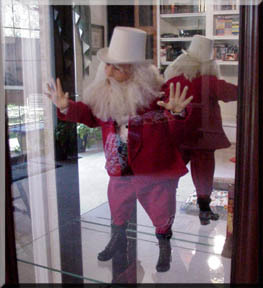 On the right is a photo of Santa saying, "LET ME OUT" from inside my display cabinet! The cabinet has a mirrored back and glass sides, so you get a wonderful view of him.